I woke up freezing shortly after 4AM on the 27th...my blanket did nothing in the cold Minnesotan weather. So I got back on the Interstate and headed South into Iowa. 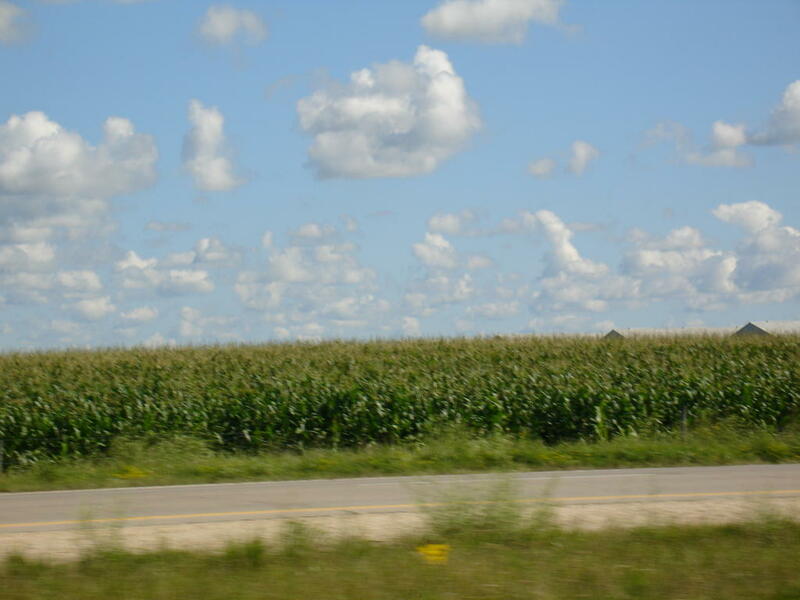 It didn't take long to get into Iowa, but I was exhausted so I stopped for a nap. Pulling into the rest stop I heard some unsettling noises - my brakes were grinding. I knew I couldn't continue on the trip in this fashion, so I decided I'd try to find a garage when I reached a sizable city in Iowa that could take a look and find the problem. My road atlas indicates the size of a city with the size font it uses for the name of the city; i.e. the smallest towns are written in the smallest fonts. So when I found a city with a medium sized font - Independence - I knew that would be a worthwhile place to stop. I drove through the main road in the city but found no Midas, Meineke, or Firestone garages. I called my brother Brendan on my cell, and through a Google search for "Brake Shops" he found a Firestone just a few blocks from my location. I drove to the Firestone, explained the situation, and the pleasant mechanic Ryan put my car right up on the lift and took a look. He said I would need new front rotors and brakes, costing (with labor) approximately $150. That sounded reasonable to me, so I told him as soon as he could get it done would be great. He actually said he'd start on it right then and told me it shouldn't take more than an hour. Within 45 minutes I had walked back to the main road in Independence, grabbed a sandwich, and walked back - my car was already parked in the lot. I paid the clerk, thanked Ryan, and was on my way once again. I realized I should have had them do an oil change while it was up, but that didn't occur to me at the time; however, there was a Quaker State just down the block with no cars lined up. I pulled in, asked for an oil change and a tire rotation, and they got right on it. As you can probably tell, the various workers I had met in Independence were incredibly friendly. Before they drove my car into the bay, I grabbed a book in order to pass the time. Catalina and Jon had previously given me a copy of the book "1776" but I hadn't yet had an opportunity to start reading it. I didn't even get through the second chapter and the work was done (the book is definitely a good read so far). I was back on the road by 3PM. I definitely cannot complain about the front brakes needing to be replaced - with the age of my car, and its high mileage, I couldn't be more thrilled of how its handled almost a year's worth of driving in a period of less than a month. If this is the only major car "issue" this whole trip (knock on wood), I couldn't be more pleased. I've always said I've wanted to visit Iowa, knowing how flat it is, and I heard you can see for miles in any given direction. I'm certainly not used to anything like that, growing up in the valleys and hills of Broome County, NY. 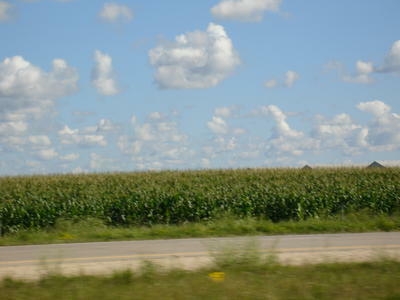 And I have seen a lot of flat land in the South like Texas and Arizona, but it was different here with all the developed farmland. I especially found it interesting how many clouds you could see, but not by looking "up," but my looking "out." In case you haven't figured it out, the movie is Field of Dreams that starred Kevin Costner. 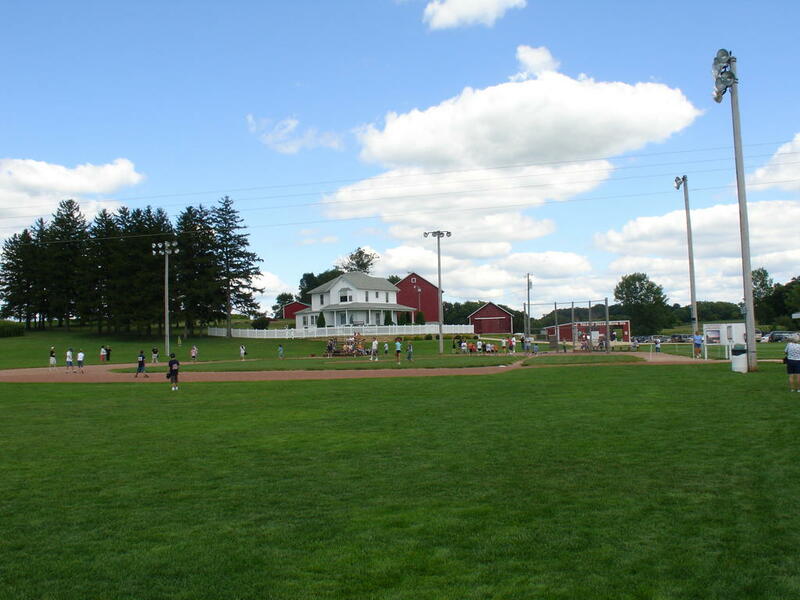 It was interesting seeing a baseball field in the middle of a cornfield, and reading a little bit of how the county worked to get Universal Studios to film the movie there. I certainly wouldn't have missed much had I chose not to visit the site, but I'm glad I did as it's a location that not too many cross-country travelers get to see. I had originally read about the city of Dyersville in my book "Road Trip America," which highlights the less frequently visited, but still unique locations in the U.S. I highly recommend the book to anyone planning a trip. Unfortunately for me, I ran out of time visiting national parks so I didn't get to see barely any of the destinations mentioned in the book. I hope to take another cross-country trip in the future where that book will be my sole guide. Within 15 minutes I was back on the road and decided I'd head towards South Bend in Indiana. 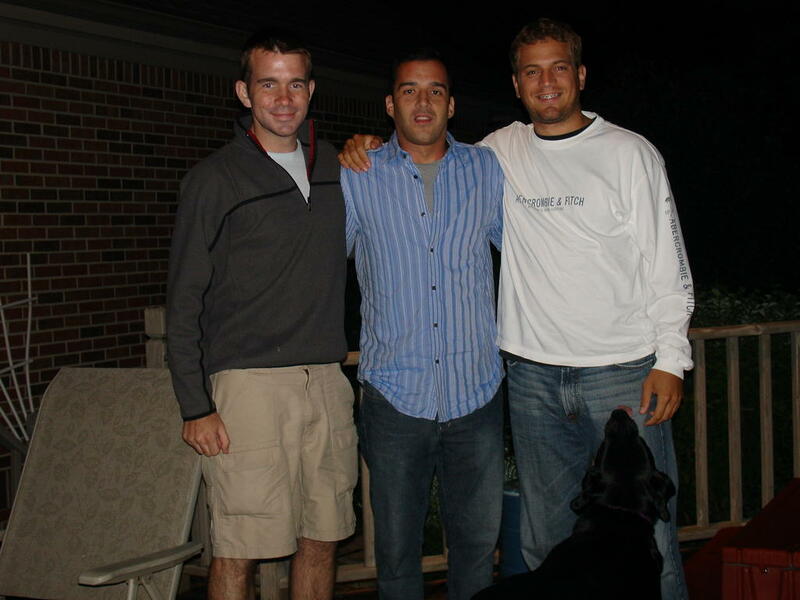 Although I would have to cross the state of Illinois and drive past Chicago, I realized it would be only 250-300 more miles until I reached South Bend, where my brother Mike's friend, Tim, lives. I had spoken with Tim days before, and he said he'd be glad to have me come by and spend as much time as I want there. I arrived at Tim's around 10:30 that night. Tim was also being visited by another mutual friend of his and Mike's - Brent. Brent goes to school in Chicago and was on a break himself so he made the drive over. We spent a couple hours just lounging around, playing video games outside, and talking about my trip. Brent headed back to Chicago that night, and I went to bed a little while later. Got to sleep in on the 28th, and Tim and eventually went out and grabbed some pancakes for breakfast (I eat like a pig when I stop and see family and friends). We spent the afternoon playing more video games and we later spent time with his girlfriend, Marsa, and her son at her house. I had a great time just getting to relax and talk with these guys who are incredibly hospitable. I'm back at Tim's now, and I'll head out of here early tomorrow. I might drive up towards the Buffalo area to see my friend Tom, and then I'll drive the four hours back home the following day. It would be pretty simple to get back home tomorrow, but since I'll be on the road it'll be a good opportunity to visit an old friend. As this trip winds down, I want to say thank you to everyone who has been following along...I didn't know how interesting this would be to the people back home, but everyone I've talked to said they have enjoyed reading this site and looking at the pictures. Your nice emails and comments made the trip even more fun, and I am very grateful for them.